Sweet, another ward filled with colorful individuals. What a lovely rug they're all stood on . . . Uh oh, it's THE FLOOR! Dangit, I was really digging the design of these guys. But there have to be some expendables in the game. 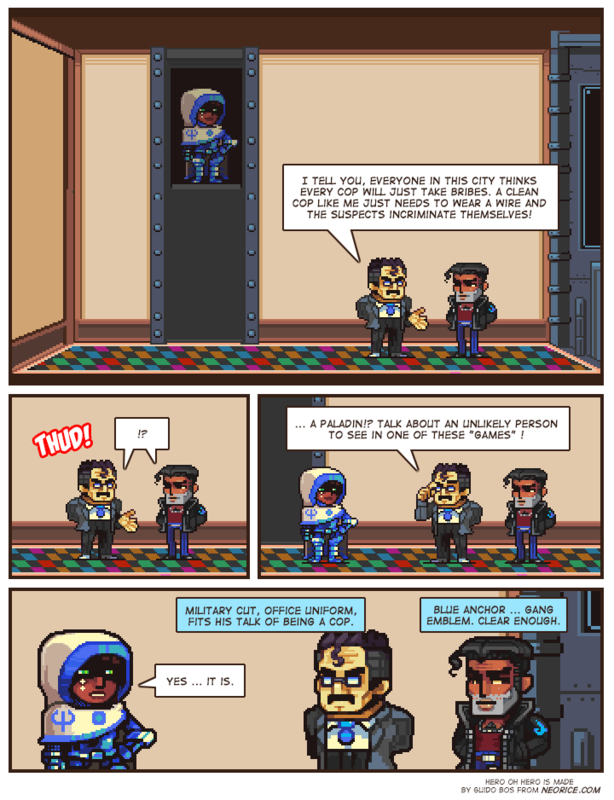 Relevant to the comic: I wonder if the gang member is an undercover cop. @Silver: If I had to guess, they're both cops. Walking around with gang emblems, and yet having a cop freely boasting about how he can get your type to incriminate themselves by simply wearing a wire seems....strange if you're actually from a gang. A saboteur? a "challenge quite suited for your role"? A room filled with checkered flooring? Maybe they are two cops, and Smile wants them to be dispatched by Paladin just for the evulz. Let me guess, they couldn't bribe him so they're going for the next best thing?